Audi A2 concept car unveiled | What Car? 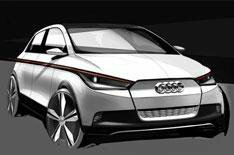 The Audi A2 concept will make its debut at the Frankfurt motor show later this month. Audi describes the A2 concept as a technical study that offers a peek into the future of electric motobility, but the car could also preview a new model line for the brand. At 3.8 metres long, the A2 concept is 15cm shorter than an A1. Its a fraction narrower, too, but 7cm taller. Audi says that clever packaging means that as with the orignal A2 - theres still plenty of space for four people. The A2 concepts styling also hints at the original A2, although the rear end resembles the A1 Sportback concept cars. The Frankfurt show car has a glass roof that switches from dark to transparent at the push of a button. The headlights use the latest LED matrix beam technology, using a combination of LEDs and microreflectors. The rear lights adapt their strength to the current lighting conditions, while the rear foglight uses laser diodes. A dynamic light runs below the edge of the window line it acts as a continuous side marker when the indicator is activated. A red bar of light flows forward from the rear lights when braking. The interior has a dynamic light that arches across the dash, as well as control surfaces that fold up when the vehicle is started. Audi hasnt released any technical details, although it says the A2 concept has an all-electric powertrain. Its unclear whether a production A2 would be related to the A1, or share its underpinnings with the Volkswagen Up. More details of the A2 concept are expected to be revealed at the Frankfurt motor show.